Buloke residents and visitors are encouraged to recycle while away from home with new recycling bins and surrounds being installed in towns across the Shire. Buloke Shire Council in partnership with the Australian Packaging Covenant and Sustainability Victoria, are rolling out a project that will see the installation and promotion of public place recycling (PPR) infrastructure in the towns of Charlton, Sea Lake and Wycheproof on the Calder Highway and also the townships of Donald and Birchip along the Sunraysia Highway. These bins will provide an environmentally and efficient service to allow the community and visitors to separate resources at these sites, in particular packaging. A reduction in litter is anticipated across the Shire with an increase in the number of waste and recycling bins accessible by the public. This campaign will improve the aesthesis of towns by keeping litter out of gardens, gutters and streets as well as minimising environmental impacts of wrongfully discarded items. What is a Resource Recovery Centre? No, it’s not a tip! Resource Recovery Centres are facilities that can accept a wide variety of recyclable materials ranging from paper and cardboard, plastics, glass, aluminium and steel to green waste, electrical waste, fluorescent tubes, scrap metal, used oil, concrete, bricks and timber. You probably know them as your local transfer station or landfill. Sorting you load can also save you money. Many items that are accepted at these facilities can be accepted for free, so recycling makes both environmental and economic sense. Sort your garden waste into one pile, building rubble into another, and other recyclable materials like metal and cardboard into another. Unsorted loads make it harder to recycle and cop the maximum fee. 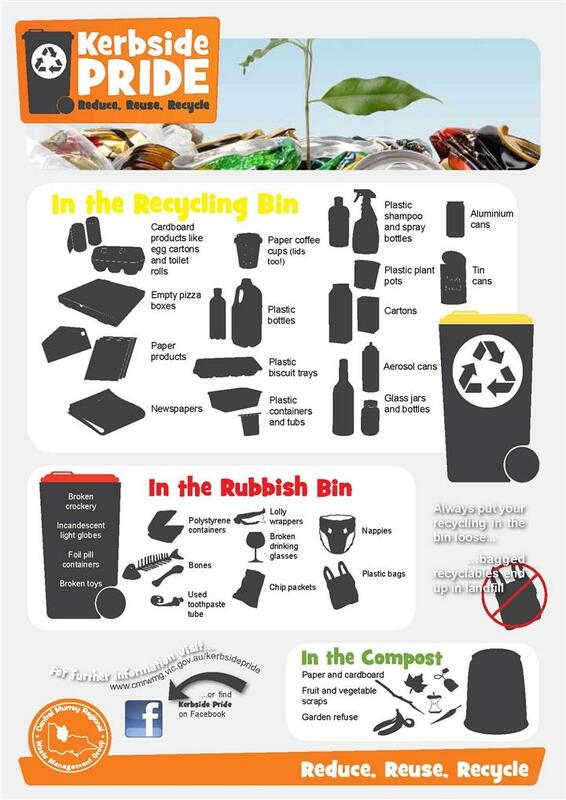 Sort your waste, and save your money and the environment. You can recycle a wide range of materials at the resource recovery centres in the Region and in many cases you can drop some of these items off for free! Rigid Plastics - Clean milk bottles, soft drink bottles, cordial bottles, detergent bottles, juice bottles, ice cream, margarine, takeaway, yogurt containers and lids. Please don’t include plastic bags or polystyrene. Glass - Clean bottles and jars (green, brown and white). Please don’t include broken drinking glasses, window glass or crockery. Aluminium & Steel - Cans, clean foil tray and clean steel cans are accepted. Batteries - Car and truck batteries. Scrap Metal - Car bodies, iron, steel, wire, whitegoods. Green Waste - This includes your lawn clippings, branches, garden prunings. Please don’t contaminate your green waste with plastic, metal or concrete. Timber - posts, frames, doors. Waste Oil - Clean used or unwanted motor oil can be disposed of into the collection tanks. Concrete, bricks and rubble - Clean concrete and bricks and rubble can be disposed of. Please don’t drop off any product that may contain asbestos. drumMUSTER - Clean and empty chemical drums (both plastic and steel) are accepted. There must be NO trace of chemical residue. Silage Wrap - Clean silage wrap, vine wrap and bunker cover can be accepted at some sites. Gas cylinders - Empty gas cylinders can be accepted at some sites. Paint - Paint tins can be accepted at some sites. Electrical Waste - Computer monitors, laptops, TV’s, video and DVD players, stereo’s, game consoles, printers, photocopiers, vacuum cleaners, telephones, mobile phones, scanners, fax machines, microwaves, hair dryers, toasters, kettles, drills, air conditioners, mobile phones. Fluorescent tubes - Unbroken fluorescent tubes can be accepted at most sites. Rubbish - By the time you have disposed of all your recyclable materials, you should have very little waste to drop off at the rubbish collection point. The Get It Sorted campaign is an initiative of the Central Murray Regional Waste Management Groups, supported by your council.